Flashback to a younger and more starry-eyed gamer. Obsessively playing through Zombies Ate My Neighbors engaged my interest in another game, but one that most people haven’t heard of, let alone played or owned. I, of course, saw one advertisement and immediately begged my parents for the game. After much searching, a little game called Ghoul Patrol joined my ever-growing collection. Not only did this sequel fall completely off of the radar before it even landed on it, but even die hard Zombies fans have never heard of it for the most part. “What’s the deal?” you might ask, “How could such an awesome game have such an invisible sequel?” Well, the answer is simple. Zombies Ate My Neighbors was a cult classic in and of itself. That game wasn’t on many peoples’ shelves in its heyday. On top of that, Ghoul Patrol was not originally meant to be a Zombies sequel, according to stories out of the publisher at the time. 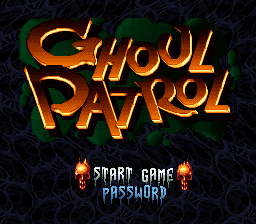 It’s said that the original game was flopping so poorly in development that the team decided to make it into Ghoul Patrol so it would sell. Before I reach into this review, The game, much many some of our other beloved games of the time, was reskinned so that it would be more desirable to the public. Poor Zeke and Julie. After their last adventure against the evil Dr. Tongue and his horrible minions, everything seems peaceful. Just for fun, they decide to check out an exhibit on the ghosts and demons of the dark ages. Before you can say ‘Emit snomed dna stsohg s’ti’, a terrible demon appears from the exhibit and vows to use our heroes as a way to take over not only their world, but the worlds of other times as well. Once again, our plucky young monster hunters are thrown into battle with legions of the undead. This time, however, they must travel through time to stop the demon from taking over the world. Now, as far as comparison to the original game, this game has a couple of advantages that the other game didn’t. First of all, flimsy as it may be, there’s a plot. It’s not a great one, but it’s prevalent in the game. Secondly, the game is broken up more than the original. You travel through five time periods, including the Ming Dynasty, modern times, and the Middle Ages. 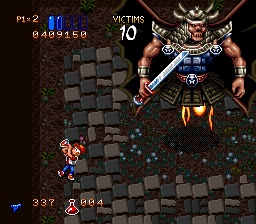 You spend a couple of levels in each era before facing a boss demon, which on average is about ten times the size of your character and really gives a sense of an epic battle. After that, you move onto the next world. The downside to that is that the levels are much larger than Zombies, and sometimes it feels like you’re spending a bit too long in one locale. 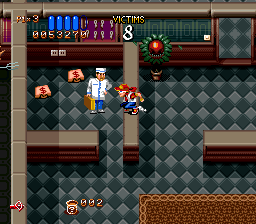 To even this out, the game runs about two hours or so, depending on your experiences with it, a figure that is paltry compared to the original game. The game also ha s its share of flaws in design. While the victims are much easier to save (most are sanctioned off in their own rooms behind locked doors), the ways to die a cheap death are glaring. The last few levels in particular, there are jumping puzzles which challenge your depth perception of the screen as well as your ability. Most jumps in these levels can’t be done without running, and even then, it’s an annoying chore. Losing a life to the fiery blade of a ghostly samurai? That’s fine. Losing three lives to pit no bigger than your thumb? Enraging. The only other issue to be taken with the game is that it seems to have lost the quirkiness of the original. Gone are the tongue-in-cheek references. The plot of the game may be satirical, but you can’t help but get the feeling that the designers played it straight this time around, trying to get a buck off of the Zombies crowd and rushing the end job. It’s still fun and somewhat light-hearted, but the game itself falls short so far as humor and tone. Have no fear, though. There are some really good points to the game. Our kids have learned a few new moves since their last adventure. Not only can they jump over obstacles to reach victims and other areas, but they can slide, hastening their retreat or advance with just a push of the button. These mechanics add a level of gameplay that the original didn’t necessarily have. Zeke and Julie can also run faster by holding down the attack button, which helps speed along the process or make longer jumps possible. All in all, it feels smoother and more technical. While running and jumping around, one might also notice that the array of weapons has gotten smaller. If memory serves, you find five or six weapons total and about as many power ups. While this may lose a bit of variety from the original weapons and they may not be as quirky, it doesn’t take you five minutes to find the right weapon for the job. It’s a nice improvement, as it felt like having a special weapon for every enemy was a bit cluttered and masochistic at times. The only power up that seemed to change was the monster potion. Rather than a hulking monster with fists of rage, you transform into a rotting Grim Reaper, scythe in hand. With the change in tone, the Grim Reaper was a nice touch considering. While the tone of the game is different than the original, the score feels about the same. It’s well done and, even a year later, sounds like it’s higher quality than the score in Zombies. It still follows the same feel of the original with creepy calypso music in the Carribean stages and intense music for the last stage. The sound effects are distinctly play. Nothing special, and there are a lot of effects reused throughout the game. The screams from the original are still present, though, which was a smart move on the company’s part. Brighter and sharper would describe the graphics best here, but that’s not a great thing. While the color palette tends to stick to the darker and more somber colors, it’s an unwelcome change from the style of Zombies. Where Zombies was pushing the line between cartoon and macabre, Ghoul Patrol dives into the cartoon setting with dark colors. As a stand alone game, however, it’s graphically neat to watch. I know I’ve been comparing Ghoul Patrol to Zombies Ate My Neighbors from the start of this review, and I certainly don’t apologize for that. When you make a sequel to a game, you have to try and meet certain standards. 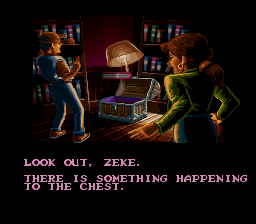 LucasArts, from what I’ve seen, has yet to give us a terrible game. This game is not as good as Zombies Ate My Neighbors. It’s too short and plays like the more mature PG-13 version of its predecessor, but if you enjoyed Zombies Ate My Neighbors, Ghoul Patrol will be fun for an afternoon. You can play through the game with a friend and enjoy it. While there are much worse sequels out there, Ghoul Patrol sits in the shadow of its predecessor, but it’s still a good game despite any flaws or design changes.